SAP Software Solutions also has an IT internship available in Pittsburgh, PA for their Student Training and Rotation (STAR) program. This entry was posted in internships on February 25, 2019 by Gianna Barnes. This position pays $10 per hour. If interested, please contact Mr. Gary Hoffman at ghoffman@questeq.com. This entry was posted in job opportunities on February 5, 2019 by Gianna Barnes. Most of you are probably preparing for careers in cybersecurity. I myself will be graduating this Spring with two degrees in hand. But as I start thinking about graduation, I have to ask myself: is this enough? Will my degrees get me where I want to go? 1. Don’t specialize just in security. The best security professionals are well-rounded individuals. Even if you are great at the security side, you should sharpen your skills in other departments. It would be beneficial to learn the fundamentals of data networks, gain experience with multiple operating systems, or become proficient in multiple scripting languages. Get to know as many people in your industry as you can. Go to on-campus events, make friends with your professors, attend career fairs. Knowing many people in your industry can help you greatly when it comes to finding a job. 3. Start studying up on IT basics. Learning IT fundamentals is an important part of having a successful cybersecurity career. Pay close attention in your classes that teach these fundamentals; they may not be the most fun, but the information that you learn will benefit you immensely. The Security+ certification is a good place to start. This shows employers that you can handle the job duties of a cybersecurity job and that you know the fundamentals. Your Computer Network Security course should provide you with the opportunity to take this exam. The Network+ certification is also in high-demand. 5. Show initiative in your own time. Self-learning and experimentation is critical. Many employers will ask you about your home lab: what kind of systems you are running, the level of security, what work you’re doing. They want to know what you have learned in your own time. 6. Hone your data analysis skills. Any cybersecurity expert should have the ability to notice trends in large amounts of data. It’s worth it to take a course it data analysis to gain these skills. Hopefully after reading this article, it will inspire you to get a jump-start on your career. But one of the most important things you can do is never stop learning! Get as much education as you can. Fill those big brains with all of the knowledge you need to be successful. Source: Laurence Bradford, Forbes Magazine. How to Start a Lucrative Career in Cybersecurity. This entry was posted in cyber forensics and information security on November 1, 2018 by Gianna Barnes. 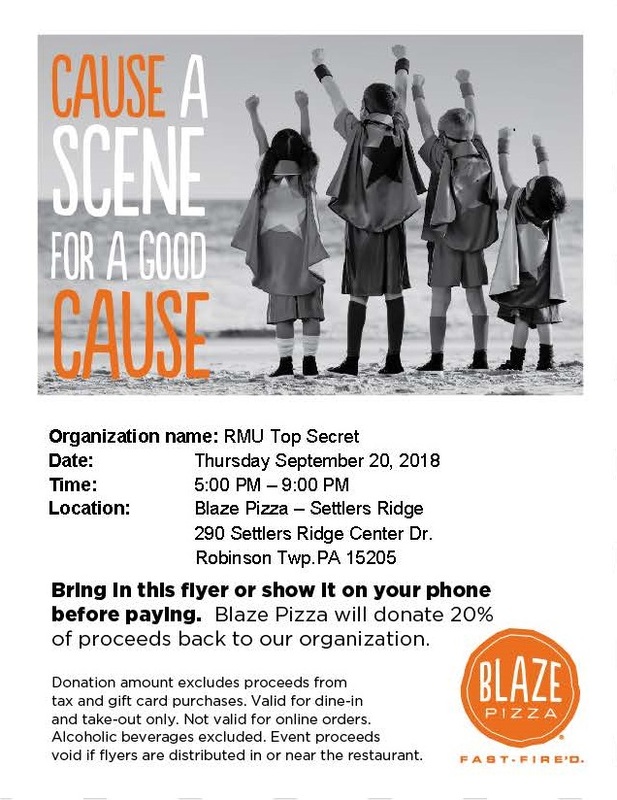 Top Secret Colonials (TSC) will be hosting a fundraiser at Blaze Pizza this Thursday, September 20th from 5:00-9:00 pm. If you bring in the attached flyer, Blaze Pizza will donate 20% of all proceeds back to TSC. Come out for some great pizza and support a good cause! This entry was posted in events, top secret colonials on September 19, 2018 by Gianna Barnes.